It’s a block! It’s a nesting toy! It’s an awesome 3-for-1 soft knit nesting set of blocks! This year at the Pratt graduate show we spotted Elizabeth Pavese’s handmade, knit nesting blocks and instantly fell in love. These cute, brightly colored blocks serve multiple play functions, as they can be nested, stacked, buttoned and unbuttoned, and offer hours of delight and fun learning for tots. 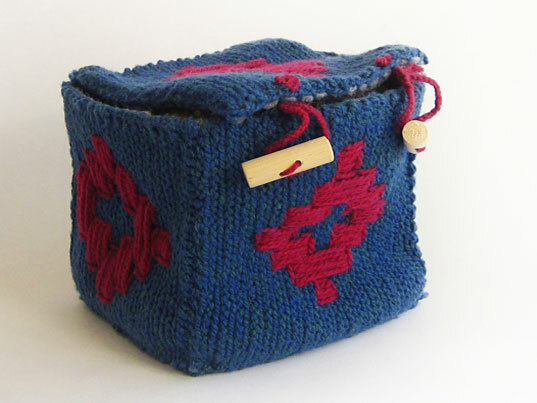 Even better than that is that these charming blocks, called Cajalana, are handmade in Alpaca wool. Liz designed these toys with the idea that they could be crafted in Bolivia by craftswomen – providing an income and livelihood to impoverished women, while preserving indigenous craft techniques. Pavese hasn’t yet started producing this beautiful toy, but hopes to work with a manufacturer to bring this to market soon. In the meantime, Liz, can you put these toys on Etsy? We get first dibs! It's a block! It's a nesting toy! It's an awesome 3-for-1 soft knit nesting set of blocks! This year at the Pratt graduate show we spotted Elizabeth Pavese's handmade, knit nesting blocks and instantly fell in love. These cute, brightly colored blocks serve multiple play functions, as they can be nested, stacked, buttoned and unbuttoned, and offer hours of delight and fun learning for tots.